When you are already spending money to go out to eat we know you don’t want to spend money on parking as well. Just pull up to the front, hand us your keys, and we will take care of the rest – free of charge! The weather is getting colder and we do not want you to have to park and then walk to come see us. Our experienced valet team will take great care of your car and make sure it is ready and waiting for you when you are leaving the restaurant. Mulino is the perfect place to bring friends, family, coworkers, or a date, and now we have made it even easier to enjoy dinner or drinks with us. To make things more convenient for you, you can make a reservation online through OpenTable. We are open Tuesday through Thursday from 5 p.m. to 10 p.m., Friday & Saturday from 5 p.m. to 11 p.m., and Sunday from 4 p.m. until 9 p.m. 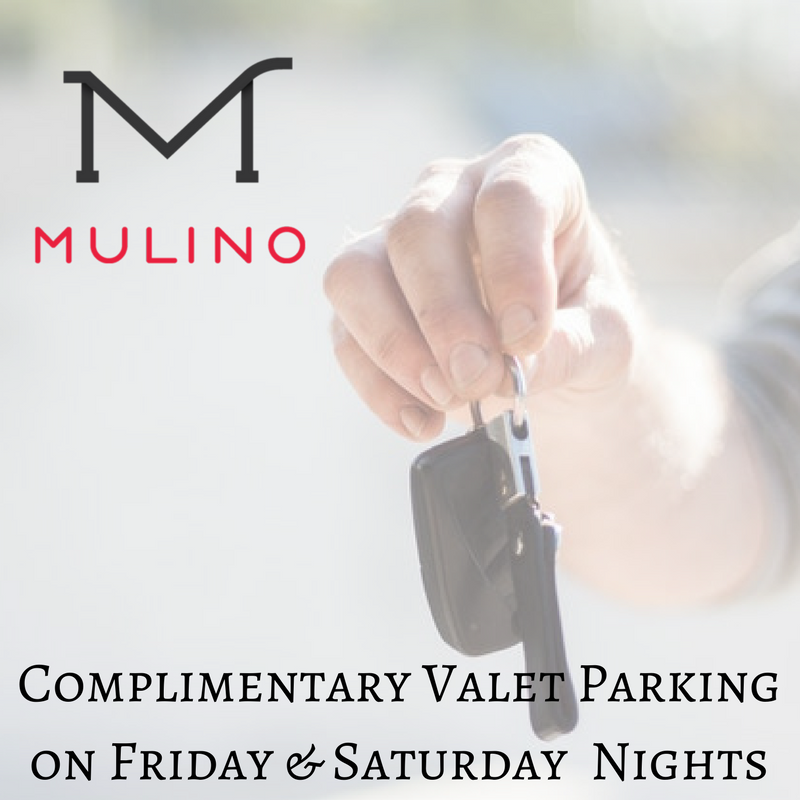 Though valet parking is only available on Friday and Saturday, we have a large parking lot that you are able to easily park in during the week for free. Have a special request or would rather talk to someone on the phone? Give us a call at 919-838-8595 to book a reservation. At Mulino Italian Kitchen & Bar we want to provide a dining experience that takes the curious on a richly rewarding gastronomic journey across the Italian culinary landscape. Enjoy delicious cuisine, wines, and a complementary culinary education in the history of Italian cuisine, all in a cozy environment.